We are pleased to offer our newly introduced, patent pending grout sleeves. They are a tapered polypropylene sleeve, 3½ inches tall with a slightly funneled flange at the base. These sleeves are easily tapped down over the bolts in the grout trough in place of foam rings. Once installed, they will not float in the grout, they will protect the bolt from contact with grout and they will prevent grout from going down into the bolt sleeve. The best feature is that they displace almost no grout. 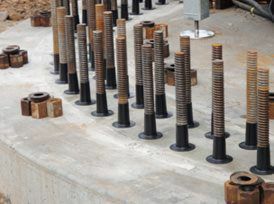 Of course, foam rings displace a great deal of grout once they are compressed by the tower flange, effectively resulting in grout voids around every bolt in your grout bed. This amounts to a surprisingly large loss in compressive strength. Our grout sleeves project approximately one inch into the base flange when the base is set. 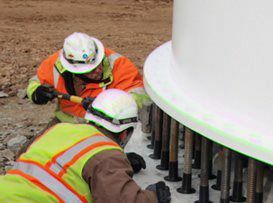 The top leading edge provides the added benefit of preventing the grout from traveling up through the flange bolt holes, where it can interfere with proper tensioning. Our grout sleeves are fast and easy to install. There is no added labor to cut foam and tape it. They are approved for use by all of the major engineering firms in the industry and they are priced competitively with foam.